This simple, speedy pasta salad is the perfect dish to prepare for picnics or lighter, more summery meals. Dairy-free, gluten-free and full of healthy fats and complex carbs, it's also the ideal salad to pack into lunchboxes to keep you fuelled for a busy day! 1) Cook the pasta according to packet instructions, then rinse under cold water, drain and place in a bowl to cool. 2) In the meantime, make your avocado sauce by blitzing all ingredients together until creamy. 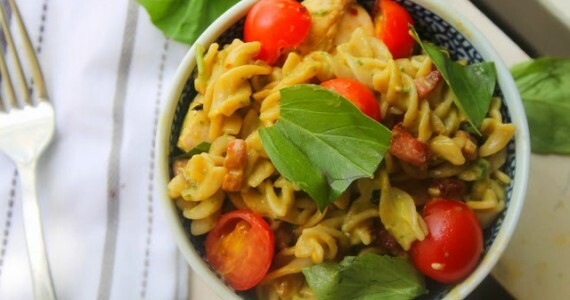 Toss the sauce through the cooled pasta, stirring in the tomatoes, basil, cooked chicken breast chunks and bacon pieces. 3) Tip into bowls and serve with another squirt of lime juice, if desired, and enjoy!